Indian athletes continued to rule the roost on the fifth day of action on Tuesday, 9 February, at the 12th South Asian Games in Guwahati and Shillong. After consolidating its position at the top of the medals tally on Monday, more gold medals followed for India earlier this morning, as the number of gold medals and the total medal count increased to 58 and 84, respectively. 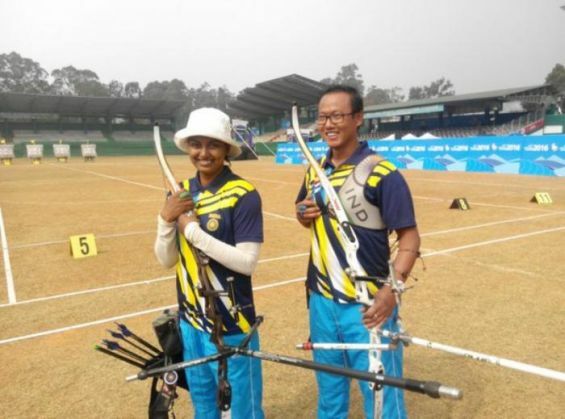 In archery, India won gold medals in the men's team, women's team and mixed team events, with local hero Jayanta Talukdar playing a prominent role in the men's section. On the other hand, Sushila Pawar added another weightlifting gold for India, as the gulf between the hosts and second-placed Sri Lanka continued to widen in the medals tally. Sri Lanka, with 11 golds and a medal count of 64 come in at second place while Pakistan occupy the third spot with 4 golds. Bangladesh are at fourth with three gold medals, with Nepal and Afghanistan are at fifth and sixth, respectively. Bhutan and Maldives, both of whom opened their account on Monday, occupy the last two spots.